The Congress has taken the BJP to task for raising an accusing finger at Vice-President Hamid Ansari for the adjournment of the Rajya Sabha on December 29. Hathras/Lucknow, Dec 31 Uttar Pradesh Energy Minister Ramveer Upadhyaya was at the centre of a controversy today after he launched a tirade against Lokayukta Justice NK Mehrotra and even threatened to get him removed. With several members of the Mayawati ministry facing the heat from the anti-graft ombudsman, Upadhyaya went on the offensive, claiming he had a better understanding of law than the judge. A hike of around Rs 2.10-2.13 per litre in petrol price is needed because of weakening Indian currency, but oil companies are unlikely to revise rates today as scheduled and instead may do so on Monday. Relief operations were launched on war-footing to bring back normalcy in cyclone Thane battered Tamil Nadu's Cuddalore district and the adjacent Puducherry, as the toll caused by the severe storm mounted to 42 today. Union Home Minister P Chidambaram will inspect cyclone Thane ravaged villages in Puducherry and Cuddalore district in Tamil Nadu tomorrow. 'Metro Man' E Sreedharan today handed over the baton to his colleague Mangu Singh after a momentous 16-year tenure as Managing Director of Delhi Metro during which he constructed and spread the network far and wide across the National Capital Region. The stream of culture is an ever-flowing one. New influences, trends and voices emerge, replacing or merging into the old ones. Despite its flow of continuity, this stream, in 2011, stopped several times to take stock of its colossal loss. The Capital had a foggy morning Saturday, affecting air and rail traffic, but a clear day throughout. The Met Office has forecast a partly cloudy sky on New Year's Day Sunday with a possibility of light rain. Singhvi said, “The BJP has habit of sensationalising and seeing a conspiracy lurking everywhere. Now, they want to pass on the responsibility as they were never interested in the passage of the Bill,” said the Congress spokesman. He said, “It is a clear-cut case of guilt complex. Assassins are trying to accuse the victim of the murder of democracy,” in reply to a suggestion from the BJP that Ansari acted at the behest of Congress president Sonia Gandhi. The Congress spokesman reminded that whenever decisions have not favoured the BJP it has attacked the Election Commission, the CBI and other institutions. Singhvi was reacting to the charge of the Leader of Opposition Arun Jaitley who did not spare the Rajya Sabha Chairman in his tirade against the government in his media interaction a day after the Upper House fiasco. "The presiding officer could have taken the sense of the House and continued with the session. But the Chairperson thought otherwise," Jaitley said. CPM leader Sitaram Yechury on the other hand defended the Vice-President saying, "To be fair to the Chair, the Chair can extend the session only at the call of the government and if the government didn't ask for it, the chair is helpless." Uttar Pradesh Energy Minister Ramveer Upadhyaya was at the centre of a controversy today after he launched a tirade against Lokayukta Justice NK Mehrotra and even threatened to get him removed. With several members of the Mayawati ministry facing the heat from the anti-graft ombudsman, Upadhyaya went on the offensive, claiming he had a better understanding of law than the judge. The remarks were under the scanner of the Election Commission which said it is awaiting a report from the District Magistrate of Haathras in this regard. "The District Magistrate has informed about yesterday's incident and he is sending a factual report to the chief electoral office," Chief Electoral Officer Umesh Sinha said. He said that once the factual report was received, it will be examined whether the minister's remarks come under the purview of model code of conduct or not. "We will have a look at the report and further action will be taken accordingly," Sinha said. Upadhyaya while addressing a public meeting in Hathras last evening had made a reference to BJP national general secretary Kirit Somaiya's complaint against him with Lokayukta, but said nothing was found. State-owned oil companies, as per practice, revise rates of petrol on 1st and 16th of every month based on the average imported price and exchange rate during the fortnight. As per this schedule, new rates were to be announced today if they were take effect from tomorrow, but top officials at oil companies said the revision is "99 per cent unlikely today". The oil companies, they said, will decide on revising rates only on Monday. The rate change may, however, need a political clearance as Assembly elections in five crucial states, including Uttar Pradesh and Punjab, have been announced. "While international price of gasoline (against which domestic petrol prices are benchmarked) are more or less at the same level (as at the time of last revision), the rupee has depreciated to about Rs 53 to a US dollar," an official said. This warrants an increase of Rs 1.78 per litre and after adding local sales tax or VAT, the desired hike in petrol price in Delhi is Rs 2.10-2.13 a litre. As the administrative machinery was put in top gear, Chief Minister Jayalalithaa said nine more people have died in rain related incidents, taking the toll to 42, following the severe cyclonic storm that crossed Tamil Nadu coast yesterday. She said five people were killed in Cuddalore, the worst affected district, three in Kancheepuram and one in Theni. She also announced a solatium of Rs two lakh each to those killed. Thane, packed with wind speeds of around 135 kmph, claimed 33 lives and wreaked havoc,particularly in Cuddalore and Union territory of Puducherry, leaving around 20,000 people homeless on Friday. Parts of Cuddalore district wore a battered look with hundreds of uprooted trees and electric posts strewn across roads. Essential items like milk became scarce while officials started supply of drinking water through 60 tankers. Rural Industries Minister M C Sampath, overseeing relief operations, said normalcy would be restored in a couple of days in Cuddalore district. District Collector V Amudhavalli said five senior IAS officials are supervising relief work and assessing damage caused by the cyclone, which has since moved out of the Bay of Bengal and weakened into a well marked low pressure over the Arabian Sea. Puducherry, which remained cut-off from adjoining districts in Tamil Nadu, is fast returning to normal with road and rail traffic resuming today, officials said. Sreedharan (79), architect of the Konkan Railway project who joined the Delhi Metro in 1995, retired after 16 years of service in the Delhi Metro. His successor Singh has worked closely with him during the construction of the Metro network in the Capital. The 'Metro Man', who joined the Indian Railways in 1953, flew in from Chennai this evening and formally handed over the charge to Singh, 56, who oversaw the high-speed Airport Metro Express Corridor, at a brief ceremony at the 'Metro Bhawan'. Sreedharan, credited with restoring the Pamban Bridge in Rameshwaram washed away in 1963 floods in Tamil Nadu in just 46 days, retired after having worked in government service for over 58 years of which 16 years he spent in Delhi Metro. The technocrat not only built the Metro network in Delhi but was instrumental in expanding the network across the NCR with satellite cities like Noida, Ghaziabad and Gurgaon getting the modern transport system. It lost several luminaries whose contribution to the world of art remains irreplaceable. Almost all the stalwarts the art world lost this year started their career when Indian art had no identity of its own. Had it not been for their unquestionable passion and conviction for the art form they pursued, Indian art forms wouldn’t have emerged out of the shadows of the colonial cultural supremacy. In the demise of Bharat Ratna Pandit Bhimsen Joshi (88) on January 24, Hindustani classical music lost its most powerful voice whose contribution in refining and popularising ‘khayal gayki’ was immense. This singer, with a distinguished voice that was powerful, exercised amazing breath control, infused fine musical sensibility in his oeuvre of ‘khayal gayki’ for generations to emulate. He kept the excitement of ‘khayal gayki’ pulsating by constantly infusing it with intelligent yet subtle fusions from other styles. On July 24, the Hindustani music tradition lost its senior-most exponent of Dagar Bani, Ustad Rahim Fahimuddin Khan Dagar. An exponent of ‘Dhrupad gayki’ whose relentless effort to keep the Dhrupad tradition alive amid an all-pervasive ‘khayal gayki’ was no less heroic. What is more amazing is the fact that he left behind dedicated disciples who would keep the spiritual and intrinsic aspect of erudition alive in their rendition of ‘Dagar Bani’. In November, Sultan Khan, who worked relentlessly to infuse new life to ‘sarangi’ by his accompanying vocal recitals, passed away. The world of music lovers lost their beloved ‘ghazal king’ Jagjit Singh in October. It was because of Jagjit that an entire ghazal industry came into existence and thrived. With the loss of Bhupen Hazarika, the music lost its most powerful and popular folk voice. Leaving a blot on the credentials of Indian secularism, MF Husain died at 95 in his self-imposed exile at London. He is credited with bringing recognition to what is now known as Indian modern art. The defining moment for modern Indian art is believed to be the day when Husain’s work was auctioned by Christie’s for $2 million. This brought Indian art to the notice of a thriving global art market, but for Husain, it spelt doom. Though not as flamboyant and maverick as Husain, Jehangir Sabavala too left Europe and a lucrative career in art to create a niche for Indian art, and worked towards it in his own quiet way in Mumbai. The ever-evolving artist left behind a legacy of work, that is rated high both in the language of commerce and in terms of inspiration for the next generation of artists. These artists expanded the canvas of Indian art large enough to be consumed by generations of artists. Shammi Kapoor, the ‘yahoo’ man of the 60s and a rebel at heart, retained his own special effect on the screen in his very own unconventional way. Kapoor made the silver screen pulsate with his inimitable energy and dance in the 50s and 60s, and later, kept his versatility alive with character roles. 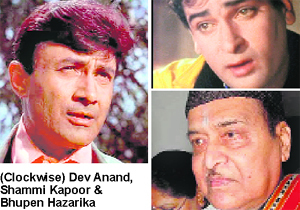 Dev Anand, the forever young-at-heart hero died at 88, leaving behind an enviable body of work - some 110 films he had acted in, and some memorable cult films like “Guide”, “Hare Rama Hare Krishna”, “Jewel Thief” etc that he produced. The Met Office said: "The skies will be partly cloudy and there is a possibility of light rain Sunday. The maximum and minimum temperatures are likely to hover around 22 and 9 degrees respectively." The minimum temperature recorded Saturday was 6.8 degrees while the maximum temperature was 23.3 degrees - normal for this time of the season. Humidity wavered between 100 and 57 percent. 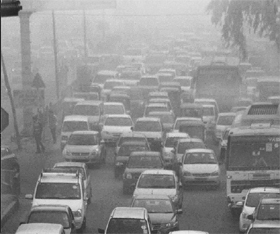 Visibility was down to a mere 50 metres at the Indira Gandhi International (IGI) Airport at 8.30 a.m. In other parts of the city, the visibility was around 250 metres. The thick blanket of fog wreaked havoc on air, rail and road traffic with 132 flights and 62 trains being affected. Delhi International Airport Ltd (DIAL) officials said 96 domestic and 36 international flights were delayed due to poor weather and visibility. According to the website of the Northern Railways, 27 trains were cancelled while 32 were delayed.